Are you making beauty products for sale? We’ve noticed that many beauty and cosmetic producers are using Avery WePrint labels. But are you aware of the regulations for labelling beauty products? The law governing the sale of beauty and cosmetic productions carries as maximum fine of £20,000 and a maximum prison sentence of 12 months for those convicted of breaching them! Here’s what you need to know about labeling beauty products. What regulation are beauty products governed by? EC Regulation No. 1223/2009 on Cosmetic Products became part of UK law in 2013. It covers products sold in the European Economic Area. The main purpose of the legislation is safety. It applies to all cosmetic products that are for sale or being given away free as a commercial promotion. If it’s not possible to fit the precautionary information and/or ingredients information onto the product label or packaging, it can be on a label, leaflet, tape, tag or card that’s attached or enclosed. For products such as soap or bath balls, the ingredients can be shown on a notice close to the container in which the products are on display for sale. If you’re using perfume and aromatic compositions, nanomaterials or colourants, make sure you’re familiar with the special rules for these. The terminology for listing ingredients is prescribed in the International Nomenclature of Cosmetic Ingredients. An online version is provided by the Personal Care Products Council, which you can access by subscribing here. In the UK, the regulations are enforced by local Trading Standards Officers. So if you’re operating in more than one area, you need to form a partnership with the local Trading Standards Authority where the decisions are being made. Every person or company selling cosmetic products within the European Economic Area must have a ‘Responsible Person’. The Responsible Person can be an individual or a company. Their job is to make sure that the regulations are adhered to. They must also ensure that each product has a complete Product Information File, containing all the mandatory information on the product, including the Cosmetic Product Safety Report – a safety assessment performed by a qualified professional prior to the product being placed on the market. The regulation also lists prohibited substances and substances which are subject to certain restrictions. It also sets out the use of UV filters, colourants and preservatives. To see the original Regulation (EC) No 1223/2009, click here. The UK Cosmetics Toiletry and Perfumery Association has produced a handy guide to the regulations which you can download from this website. 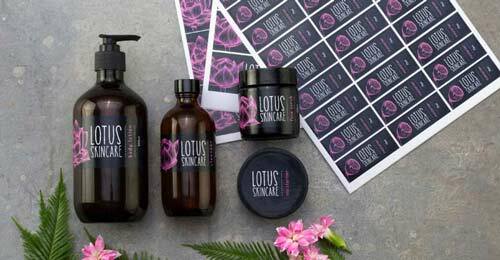 Are you ready to make labels for your own products? Go to our labels section, choose your shape, size and materials and start designing. If you need cards or tags for additional information, see postcards and greetings cards. Please note that this article is based on our understanding of the law as of February 2018. We cannot guarantee the accuracy or completeness of this information and shall not be liable for any loss, damage or injury directly or indirectly caused by or resulting from this information or its use.